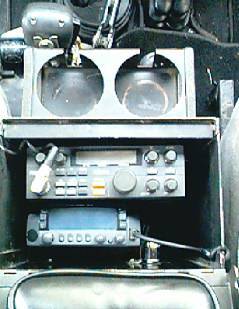 The Masterac Console serves as a secure place for my CB radio and Kenwood dual band Ham Radio (TM-V7A). When I leave the vehicle parked, the am/fm radio can be locked in the rear section of the console and the CB and Ham locked up in the front section. I made a pad that attaches to the inside of the front door. The pad also provides a place to rest your hand when the door is open. 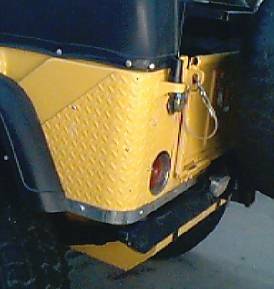 Everyone likes my hide-a-way place for the Hi-Lift Jack--in front of the rear tire. 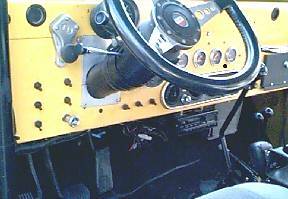 Most of the time I use a small hydraulic jack which I keep under the passenger's seat. But when you need a Hi-Lift Jack nothing else works as well. The handle is in the rear under-seat storage. 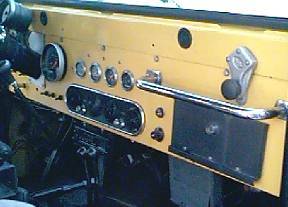 The foot and slider are under the passenger's seat. Recently I upgraded to the new Warn Hub kits from a standard Superwinch Hub. 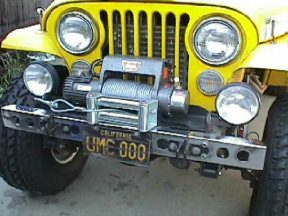 The Superwinch hubs were the only hubs I have found to take the stress of a Detroit Locker. To keep the bolts from working loose I use a stud kit (studs & locking nuts) from Tri-County Gear--the center of their stud is twice as long as what you can buy at a hardware store, thus providing for better seating of the hub. The new Warn Hub kits work well and don't have the problem of hub bolts working loose. I take a lot of stuff on every trip. 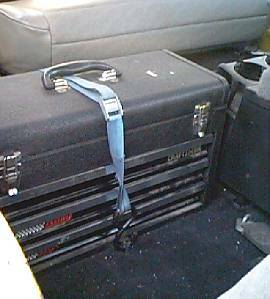 In order to store all those goodies, I use two Masterac speaker cabinets and a custom built under-seat rear storage. The under-seat storage is double hinged with two compartments. One compartment is accessible from the rear without lifting the seat and the other by lifting the rear seat. 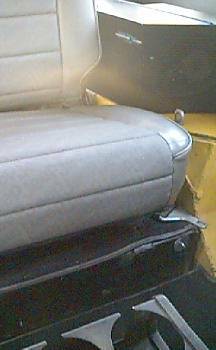 By the way, the rear seat is a stock "fold and tumble" Wrangler seat. 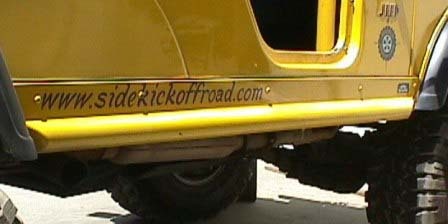 Off Your Rockers manufactures steel quarter panel protection. The way I figure it, if you're going to bolt on protection, it needs to work, and these steel panels work. I made custom brackets to hold the CB and Ham radio antennas and welded them in place before painting them the same color as the vehicle. 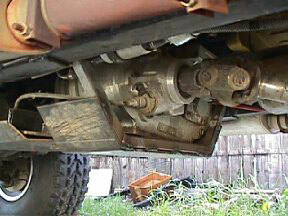 The Currie Enterprises Hybrid Dana 60 provided stronger axles, better breaks and allowed for the spring-over. I left the Tubular Motorsports on this site for information only. 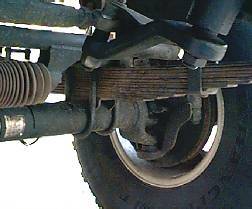 When I did finally go with a spring over on my CJ I began bending tie rods and had bump steer (the jerking of the wheel as the suspension flexes). 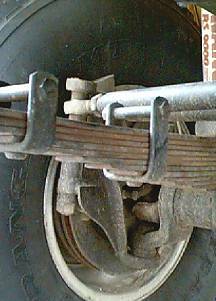 To fix this, Tubular Motor Sports (out of business) extended my knuckles and raised the tie rods over the springs. It worked. National Spring built the springs to handle the weight of the vehicle and the height. I welded mounting brackets together and bolted them on the floor to hold down the tool box. The tool box is just behind the passenger's seat. I built a rack to carry an ice chest behind the rear seat and in front of the spare tire. I also built a BBQ grill that exactly fits under the cooler. This gives me a good place to carry a greasy grill. 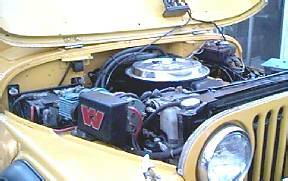 Since 1976 the CJ-6 has had a Chevy 265, 327, 350 and now a stock TBI injected 350 motor. I am unhappy with the stock performance compared to the previous built motors--I will fix that. The DC air compressor, Premier Welder and R&M Shower are essential. The air conditioning, cruise control and power steering make the trips more comfortable. 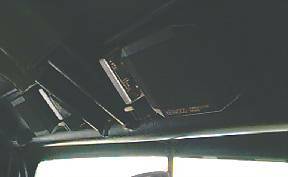 The custom overhead console is great for mounting an altimeter, temperature gauge, lights, remote speakers or anything else. 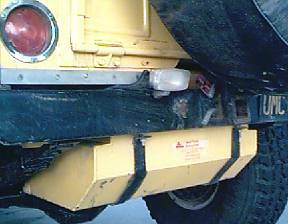 Everyone needs rocker panel protection. Originally I bought a piece of stainless steel angle, polished it and bolted it to the body with counter-sunk allen bolts. Angle iron did not provide enough body protection, but Sun Performance's new rocker panel guards did--so I upgraded. 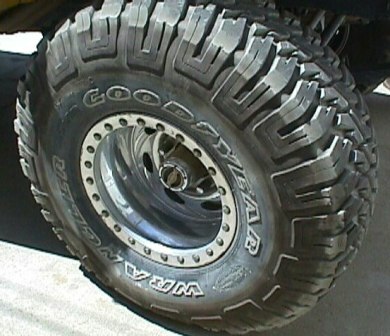 I have been using the 35x12.50 Goodyear MT for about seven years. The tread design works great in all types of off roading conditions. My only complaint is that the sidewall was easily punctured. That problem was solved with the new MT/R tire. This new tire is still flexible but utilizes patented materials for maximum sidewall protection. 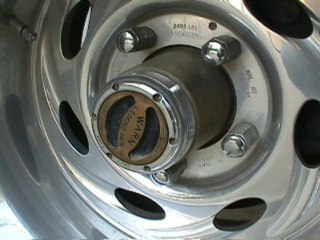 The Weld Wheel with Champion Bead locks, 10x15" can take the abuse. Tom Wood's 4xShafts built both of the driveshafts. The CV joint is on the top end. Recently I installed an Atlas transfer case with the 3.8 ratio. So far, I liked the Atlas. It is easy to shift, has low gears and supports a large output shaft--which I really needed. 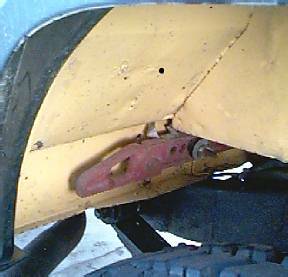 I built my own skid plate that allows good air flow. If you install fuel injection, the pump should be in the gas tank to keep it cool and thus avoid vapor locking. Aero Tank in Corona, CA has standard tanks to fit most applications but I wanted something bigger. Also my frame is different and the standard tanks would not give me the maximum gallons. So Aero Tank custom built the tank. Tubular Motorsports (out of business) replaced all of the standard ball joints with hyme joints. The trick is using the expensive ones. I've never broken one (yet). The model 300 transfer case served me well except for the broken output shafts. But now Advance Adapters is sellling an output shaft upgrade kit for the Model 300. Hint for model 300 users: the rear transmission adapter plate can be re-drilled 5/8" away from the original holes. This provided 1 3/4" more ground clearance at the end of the model 300. 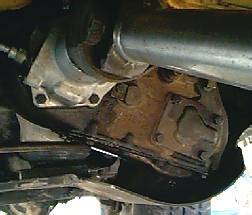 My new Atlas transfer case has several holes to allow for rotation. Because of the limited space in my 1956 CJ engine compartment I selected the smallest diameter booster which measured about 8" across and 4.25" deep. After the installation, I couldn't believe the difference--my Jeep really stops.